The reason I started this blog was because of an argument I had recently with someone who claimed that Exeter was a lovely city with 'lots of historic buildings'. I was surprised as I didn't see how anyone could think that Exeter had 'lots of historic buildings' when so many of them have been destroyed within the last century. It's true that the ancient heart of Exeter has a number of exceptionally fine and historically important buildings, and you can almost count them on the fingers of two hands: the Cathedral, the Castle at Rougemont, the Guildhall, a number of medieval properties in the Cathedral Close, three superb terraces of Georgian townhouses, St Nicholas's Priory, about a dozen surviving timber-frame merchant houses, a few interesting 15th century parish churches and one street of good Victorian public buildings, including the remains of the Higher Market and the neo-Gothic museum. Around 70% of the City Wall also survives, although this is largely overlooked. To say that Exeter has 'lots of historic buildings' is simply misleading. It does have 'lots' compared with Milton Keynes but Exeter is a 2000-year-old city, and for almost 1800 of those years it was one of the most important cities in England. Another widely-believed fallacy is that Exeter was destroyed during World War Two. It was not. It has been said to me more than once, and by more than one person, that the city council merely finished what the Germans started. But even this is untrue in some aspects, as the damage inflicted on the city in 1942 didn't even set a precedent. The city authorities had been pulling vast areas of the city down from the end of the 19th century onwards. The map left illustrates the immediate damage from the aftermath of the Baedeker Raid of 4 May 1942 transposed onto a map of 1890. These are the areas that were severely or partially damaged by high explosive bombs, incendiaries and the resulting fires. The outline of the city wall is shown in blue. The city wall area contained the city's oldest buildings and its most important buildings. As can be seen, the damage was extensive and there's no doubt that the damage to Exeter's architectural heritage was immense, including such landmark buildings as Bampfylde House, Bedford Circus, the Chevalier Inn, the Hall of the Vicars Choral, St Lawrence's church and St Catherine's Almshouses. Half of the High Street was severely damaged along with significant portions of the medieval suburb of St Sidwell to the north-east and, in the centre of the city, the area at the top of Fore Street and parts of South Street. The image right is the same 1890 map. 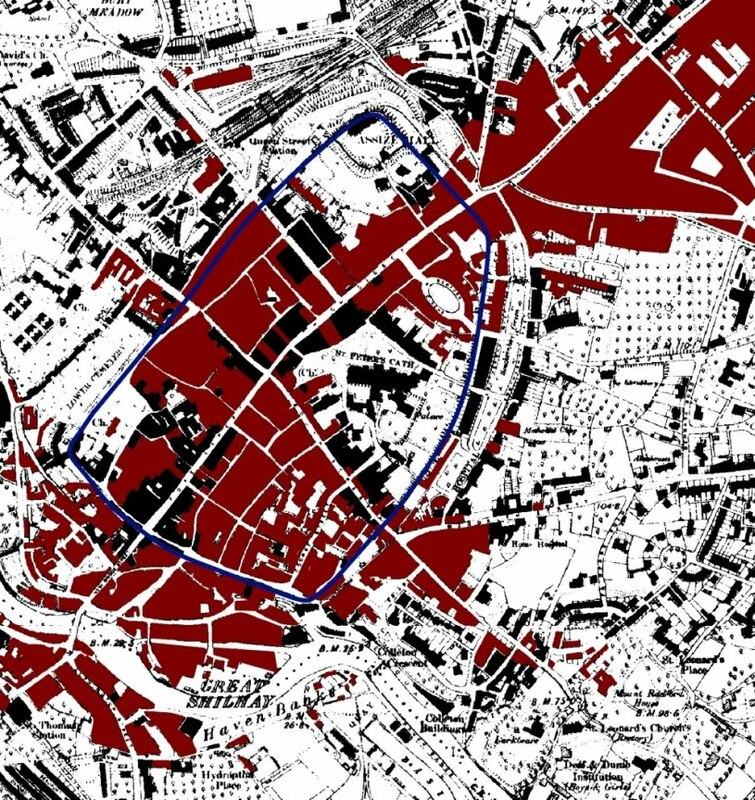 Incredibly, the areas coloured in red show property that appears on the 1890 map but which has been destroyed over the course of the 20th century. Everything in red are entire blocks of buildings that have either been destroyed in war or bulldozed by the city authorities themselves. 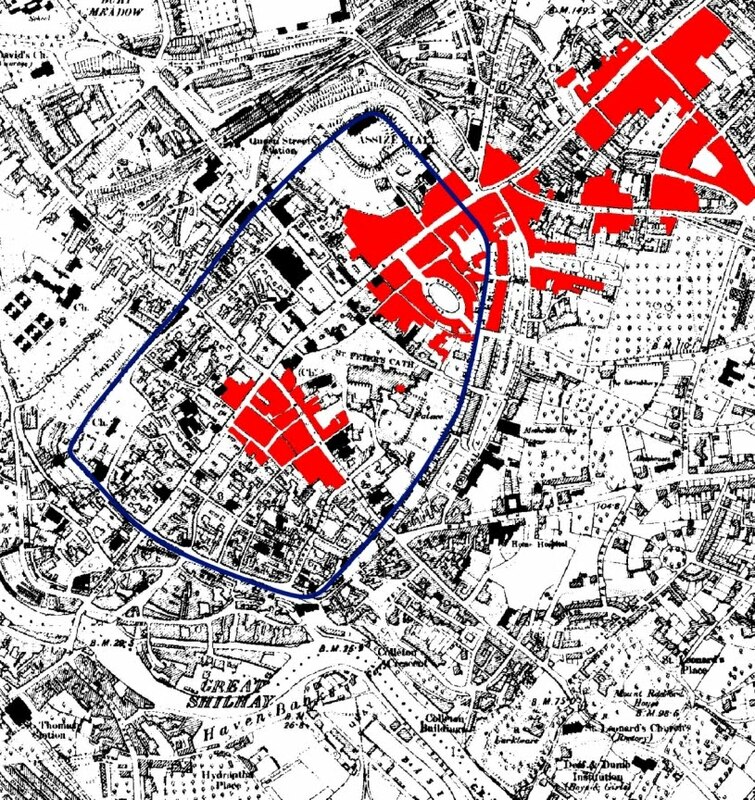 The huge areas shown in white are open areas of grass, yards and gardens, the three most notable ones within the city walls being the Cathedral precinct, the Castle in the north-west corner and the cemetery in the south-west corner. The areas in black show the only buildings which appear on the 1890 map and which are still present in the 21st century city. It is a tiny percentage. And it is an indisputable fact that the vast majority of the historic city centre dates to no earlier than 1900 at the very earliest. As can be seen, today there are vast tracts of the city where there is literally nothing to see of Exeter's architectural past. It has just gone. Not just streets but entire districts have been flattened and rebuilt. Like a snake with its own tail in its mouth, the city has consumed itself almost totally, and it is no exaggeration to say that almost nothing remains. Half of Paul Street was demolished early in the 20th century, along with half of Catherine Street. The West Quarter, including Preston Street, Smythen Street, Coombe Street and Stepcote Hill, and which contained most of the city's surviving medieval and Tudor townhouses, was razed during the 1930s. 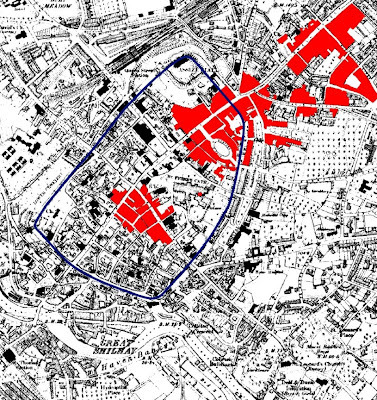 The air-raid of 1942 accounted for half of South Street and the High Street as well as half of Southernhay, Paris Street and Sidwell Street and numerous small streets and alleys. The 1950s saw the demolition of most standing buildings in the war-damaged area as well as the remains of those which could've been salvaged. Exe Island and the Edwardian Exe Bridge were bulldozed in the 1950s and 1960s along with much of Cowick Street, Alphington Street, Mary Arches Street, Magdalen Street and a whole complex of 17th and 18th century buildings at Southgate for the construction of the Western Way inner bypass. The eastern side of North Street, the remaining half of Paul Street, and nearly all of Goldsmith Street and Waterbeer Street came down in the 1970s to build the Guildhall Shopping Centre. Many roads have simply ceased to exist, like Bampfylde Street, George Street, Musgrave Alley, St Stephen Street, Sun Street, etc. etc. It terms of Exeter's historical architecture, it has been nothing but a disaster. I find it quite depressing just how much wanton destruction of historic Exeter has taken place by self important town planners , leaving a rather souless city centre . Having been born in Exeter in 1945 I can support the author's argument about the city's destruction from that time, however Exeter is not alone in such appalling behaviour as many town and city councils have put money ahead of heritage. The citizens of Exeter have the responsibility to ensure it stops from this time onwards. Hi Ken - I agree that almost every town and city council in the land have worked with planners to destroy the country's architectural heritage. Apparently Winchester, which was untouched by bombs in World War Two, had over 30% of its city centre demolished in the post-war period. Unfortunately for Exeter it had the added calamity of the Blitz to add to the pre-war slum clearances and the inevitable post-war demolitions. The Blitz should've put a brake on further demolitions within the city but it seems to have had the opposite effect, the planners and council overcome with an almost maniacal urge to start again and 'renew'. As I've written in other places on the blog, most of Exeter's pre-war landmark buildings, with the exception of the cathedral and a tiny handful of others, have survived either through either sheer luck or through the persistence of activists. Thomas Sharp wanted the museum demolished and everything that remained in South Street. The council wanted the Higher Market demolished along with the landmark Tudor buildings on the corner of Queen Street and the High Street, to name just a few examples. Attitudes towards heritage might've changed for the better but in the case of Exeter it really is, sadly, too late. Would be grateful if you could add a record of the Stoneman and Bowker buildings in Sidwell Street, demolished last year, in spite of being mapped in ECC's CA appraisal as 'making a positive cotribution to the Conservation Area'. Modest late C18 or early C19 frontages, now replaced by a Shrek-scale student accommodation block with monster dormers. I was planning on writing a post about the Stoneman & Bowker demolition. I made sure I took some photos before the demolition began. The post was supposed to follow on from a more general one about Sidwell Street but, as yet, I've not got around to writing it! Hopefully it'll happen at some point in the future.